Parallel universes: Get ready to have your mind blown. I’m always thinking about parallel universes. One of my theories, it’s not really based on any science or hard facts, just purely from my imagination, is that if parallel universes do exist, there have to exist an infinite number of them. Why? I don’t know, but it makes a lot more sense to imagine an infinite set of universes than just arbitrarily imagining them up but then capping them all at a random number. Numbers don’t really matter; I’m already getting sidetracked. So just imagine that there are an infinite amount of universes, a multiverse. And each parallel universe is a little different that this one, otherwise it wouldn’t be parallel, it would just be this one, which, I can say with some measure of confidence, already exists. OK, so we have infinite parallel universes, and all of them are different that this one. In what ways would they be different? If there are no limits to the number of universes, then there are no limits to the number of differences. So parallel universes might be drastically different than this one. I’m picturing a universe overrun by intelligent slime monsters or a world where Jesus was born on the moon instead of the Middle East. (Actually, that sounds like a great idea for a movie. I’ll call it Space Messiah.) History could take a wild turn, completely divergent from our own reality. That’s really cool to think about. I always loved reading those What If? comics where Captain America was a vampire or the Incredible Hulk was purple instead of green. Those are really fun. But then I have this idea, and it really bothers me that, if there are infinite worlds, then everything that can happen will happen, somewhere, in some other dimension. So think about it. Everything that I do is affecting the lives of my parallel counterparts all throughout the multiverse. Because if I do something here, another me somewhere else has to be doing something different. There have to exist worlds that appear exactly the same as this world, and the only differences will arise out of decisions that I make here versus decisions that an alternate me makes somewhere else. Like there could be a parallel world where I drank tea instead of coffee this morning. And maybe another one where I didn’t drink anything at all. And then another one where I accidentally drank a glass of antifreeze and died. So I think about this life, and how every time something good happens to me here, something bad happens to another me somewhere else. And if you think about infinite possibility, it gets really mindblowingly disturbing. Every time I cross a street, so far, I’ve managed to avoid getting run over by a car or a bus. But every time I make it across successfully, some other Rob must be getting splattered all over the pavement. I’m overwhelmed with these visions of the multiverse, and somewhere at some time, there is always some version of me meeting some horrible end, constantly, forever. And it’s not just cars and violent deaths. It could be routine sickness or something equally pedestrian. How many times have I taken antibiotics for strep throat? They’ve always been effective in killing off the infection. Here on this world, that is. I have no idea how my doubles are living their lives on the infinite planet Earths where penicillin never even got discovered. And then I feel just a little bit guilty every time something goes my way in life. I’d say I’m living very comfortably. In terms of all of the humans who have ever lived on this planet, I’m probably enjoying a level of comfort and stability that would seem totally unimaginable compared to the vast amounts of suffering and horror that all of the people in this species have had to endure just to get us to this point in modern society. My life is great here. Doesn’t that mean that somewhere I have to exist as a total opposite of how I exist right now? I must. My imaginary theory of infinite possibility demands it. So if I’m generally happy in my life, opposite Rob has to be generally miserable. And that’s generally depressing. But then there has to exist a version of me that’s only twenty-five percent less happy. And maybe there’s another one that’s twenty-five percent happier. Who knows? So it’s somewhat comforting to think about all the various ways in which my life could be even better somewhere else. Like every time I don’t win the lottery jackpot, which has, so far, been every single time, I always take a little solace in the knowledge that, somewhere else, on some other Earth, I’m staring down in disbelief as I match every single number on my ticket to the winning numbers on TV. It’s got to be a great feeling. And that jackpot winning Rob G. is probably super happy, excited, euphoric, but there’s this slight tinge of guilt, because he knows deep down that somewhere out there exist countless other Rob Gs who didn’t win anything. Or even worse, a Rob G. who won, but then lost the ticket. And then he got hit by a bus when he left his house. I’m kind of wishing that I lived in a parallel universe where I never wrote this. This entry was posted in Uncategorized and tagged Parallel Universes on June 30, 2012 by Rob G..
I’m not talking too fast. Stop telling me I’m talking too fast. Sometimes people try to tell me that I’m talking too fast, so I’ll tell them back, even faster, that I’m not talking too fast, but that they’re listening too slow, and I’ll have said it so fast that they’ll say, “What? See what I mean?” and I’ll respond back, “See? Exactly what I’m talking about.” And eventually any further efforts at communication will break down. I don’t think that I talk too fast. I can’t stand it when people talk too slow. Introductions are the worst. I get that you’re supposed to be pleasant and polite and everything, but to me, it’s totally selfish to monopolize someone else’s time, to start off a conversation with, “Well good afternoon! It’s so great to see you. How have you been?” all long and drawn out, the word afternoon extended pointlessly and annoyingly by an extra two syllables (af-tah- her-noo-oo-oon.) It’s selfish because whoever is doing the talking is stopping whoever is listening dead in their tracks and saying to them, “All right, this is my time now. You’re going to listen to me. And I talk slow. And there’s lot’s of extra words that don’t do anything for the discussion.” I could get the same message across in about one second with a very succinct, “Hey,” or, “Hello,” if it’s somebody important, like the President. It’s not rude; it’s polite. Polite and respectful. Respectful and humble. And bold. I’m saving you time. Those seconds add up. I like to keep a running tally of all of the time I’ve saved throughout my life by cutting short the chit-chat. Let me just tell you that it’s a lot of time. I have it all on an Excel spreadsheet. Once I’ve determined that I’ve saved a week’s worth of time, solely from talking fast and getting straight to the point, I’m going to go on a week long vacation. And it’s going to feel great. It’s going to be a vacation totally outside of regular time. And as I’m enjoying it, I’ll know that each second of relaxation and leisure are because I didn’t waste so much time making everyone else listen to unnecessary filler words and fake pleasantries. When I’m working as a waiter, I find that people from out of state (definitely out of the tri-state area) often mistake my talking fast for being rude. It’s not rudeness, although, once you point it out to me more than twice that I’m talking too fast, it can turn into a genuine being very pissed-off. I’ll go up to a table, “Hey, how’s everybody today.” If someone’s from out of town, they take this moment hostage and, without even having looked at their menu, start asking me ridiculous questions, or non-question, like, “We’re from out of town! We’re on vacation! Where are you from?” and I just want to say something like, “I’m from right here. I’m from this restaurant. I walked out of the kitchen just a second ago. And I came over here to see what you’d like to eat.” But that would definitely be seen as rude, and so I’m forced to play along with this inane banter, while I’m standing there chatting, and all of my other tables’ food is getting cold in the window in the kitchen, so by the time this table releases me from the bonds of this annoying pseudo-conversation, now I really am in a rush, and you want to see fast talking? Well I can crank it up a few notches and talk really, really fast. I could probably start reading what I’ve written so far to myself and catch up to this sentence, beating myself, getting here before I even have a chance to finish it. I just did it. The worst is when people ask me for a list of something, like flavors of ice cream or brands of soda, these lists that I have memorized in my head, that I could repeat back to you without even having to disturb the conscious parts of my higher brain. And I’m not slurring my words either. My enunciation is spot on. But if I rattle off a list of words, however clearly, if people think it’s too fast, they’ll think that I’m not taking a vested interest in their well being, and they’re on vacation and they don’t like being talked to so fast, brushed aside, not wanting to hear about where you’re from, what’s wrong with you, son you’re going to have to slow down a little bit and repeat that one more time. So I’ve trained myself when saying certain things, things that I say over and over and over and over again, like what’s in your hamburger, or can you explain this dish, or which way to the subway, that I make myself say it like I’m talking in purposeful slow motion. But this just comes out all strained, like you can hear me mentally and almost physically restraining the vocabulary coming out of my mouth, and it just sounds like I’m almost constipated or holding back a very violent form of rage, or trying not to sneeze even though my face is all crinkled and it’s obvious that I have to sneeze and, just let it out man, you’ll feel better, why hold it in, but I’m not doing any of these thing, I’m not, I’m just trying really hard to talk slow, and also when I talk slow enough I’m over-thinking how I pronounce things, and a lot of time I’ll say things different slowly, different than I would ever say anything at a regular pace. (Butter Pea-Can? Butter Puh-Kahn? I don’t remember which one is mine. How do I say it?) So now I just try, especially when saying things like lists of ingredients or something, I say the individual words in my regular fast pace, but I put a conscious pause of a second or two in between each word. It kind of sounds like robotic, like how a robot might respond to you if you asked it what type of vegetables come in your chef salad, because I need to know every single vegetable, because even the slightest presence of some taste that I find objectionable, no matter how small, no matter how subtle the flavor, well I just can’t have that, and I’ll send it back. Did you say mushrooms? You really should slow down. But the robot thing works best of all, because at least it’s not rude. And I find that if I smile constantly, the whole time, then people are more likely to just think that there’s something wrong with me, something a little off, nothing sinister, maybe a little sinister, but the sinister is very forcibly being held back, this guy’s doing the absolute best that he can to at least try to pretend like he’s smiling at you, like he wants very badly for you to have a good time, because you can tell, because he looks so visibly uncomfortable, because he wants you to be comfortable instead, instead of himself, and so whatever, at least he’s not rude. This entry was posted in Uncategorized and tagged Fast-takling, Waiting Tables on June 29, 2012 by Rob G.. I can’t believe he didn’t get bit by that snake. It looks so scary! 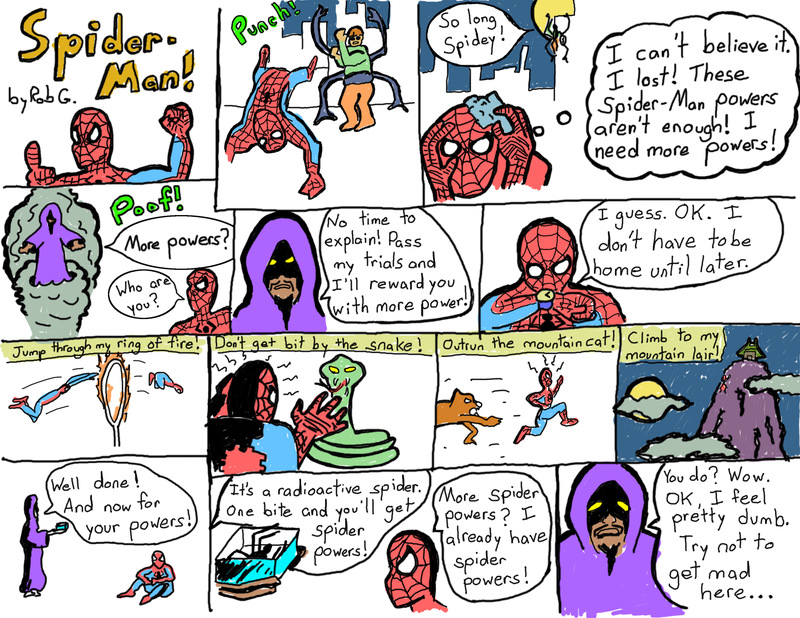 I made another Spider-Man comic. This one’s about power. Power and responsibility. I came up with that all by myself. This entry was posted in Uncategorized and tagged Comic books, Spider-Man on June 28, 2012 by Rob G.. But the lady who owns the wine store is, I think, a total imposter. She doesn’t know anything about wine. She is just an opportunist, an entrepreneur. She saw a block with no liquor stores around it and set up shop. So every time I ask her, “Any suggestions?” she’s always just pushing whatever’s not selling fast enough. So instead of having people come over my house and check out my wine selection and say stuff like, “Ooooh!” they always wind up glancing at my bottles but then trying to avert their gaze, saying stuff like, “ooooh …” and then they ask me if I have any cold beers in the fridge, and I’ll say, “Help yourself,” and then I’ll get all bent out of shape worrying that my beer choices might not be all that diverse and, seeing as how I already botched the wine, well, you can understand why I’d be a little nervous. And then every time I try to pop open the bottle I wind up, half of the time, ruining the cork and therefore ruining the whole bottle of wine. My parents gave me one of those automatic corkscrews for Christmas one year. And it’s great. But one time I was catering a party somewhere, and the waiter captain told me to bring a wine key. So I brought my automatic wine opener, which comes in a case, a big case, probably as big as a cookbook. But I didn’t know this wasn’t what he meant by wine key. So when I got to the reception, I asked where I could put my wine key case, and the captain just looked at me. That’s when I looked around at everyone else with these pocket-knife sized wine keys, but it’s not a knife, instead of a blade, there’s just a screw, something you have to turn in manually and then take out. Another waiter had an extra. I tried to pretend like I knew what I was doing. I watched the others twist in and pull out. It looked so easy. But when I did it, first of all, I had no idea how to get the foil off of the top, and when I finally got it off, the person who asked for the wine had already left for another waiter. I figured I’d open it anyway, get ready for the next wine drinker. But I botched it. I twisted the screw in and pulled, and a broken off top half of the cork came out. I have no idea how it happened. So I twisted in the screw to get the rest of it out but all I did was push the remainder of it inside the bottle, and it was stuck in there somewhere. I poured a glass to see if maybe it wouldn’t be so bad, but it was terrible, crumbs of cork floating around everywhere. I found a straw and tried to trap each piece of cork under the straw, and, if I got it, I put my finger on the top of the straw and pulled out the crumb. I thought it was a genius plan, but the captain saw me and sent me home. Looking back, it was a pretty stupid plan. I should have just found a new bottle and started over. One time I saw a cooking show or a travel show (I can’t remember which) where the host went to a place and asked for a bottle of champagne. He told the camera that the easiest way to open a bottle of champagne was to take a big knife and, with the not-sharp side, slide it up the neck in a fast motion towards the cork. So one time I tried this, but the actual bottle broke off right below the cork, sending not just the cork flying, but a chunk of glass that it was attached to. Also, the champagne in the bottle must have gotten so agitated that it started foaming up and spilling all over the floor. My dad was so pissed. “I asked you if you knew how to open up a bottle of champagne and you said yes!” he said, “you insisted!” I did insist, I guess. I just saw things going so much better and smoother and cooler in my head. One time I was drinking red wine at an office party and I thought I was making such a good impression and telling jokes and charming people and schmoozing and just being a great office-party guest. I imagined my bosses talking amongst themselves after I walked away to mingle with the other guests, saying stuff like, “That Rob is so well-mannered, such poise!” But then when I got home I went to the bathroom and saw that I must have been drinking the red wine wrong because I had red wine lips extending past my actual lips, giving the impression of a really creepy Joker like clown, and my teeth looked all grey and stained. This entry was posted in Uncategorized and tagged Wine on June 28, 2012 by Rob G.. I worked at this restaurant in high school. It was basically a diner, albeit a really good one. Maybe it was a little nicer than a diner. It definitely wasn’t fancy. Not too fancy anyway. One of the cooks was named Francisco, and everyone called him Fancy-Pants Francisco. But that’s about as fancy as it got. And they made homemade gelato, which was pretty cool. And yeah, maybe a little fancy, but mostly due to the fact that gelato is just a fancier, more Italian way of saying ice cream. Italians are pretty fancy in general. In a good way, obviously. Anyway, every once in a while this guy would come in that everyone in the restaurant called “Big Tipper.” It’s not the most creative name, but it was spot-on and it wasn’t at all an exaggeration. This guy would walk in with his family, all of them draped in their velvet Sunday sweats, and the rainmaking would commence before they even got to their table. We had a bunch of hostesses, a few middle school girls who stood at the front and handed out menus. Their jobs were basically pointless, because most people who dined at this restaurant, if given a table, immediately demanded a different one, probably just to make sure that they could visibly boss around as many employees as possible during a single meal. Big Tipper would get a table a hand each of the hostesses a fifty dollar bill. That’s huge. That’s like exactly what they would have made after a whole night’s work. Fifty bucks each and this guy hasn’t even sat down yet. Maybe you’re beginning to understand why people got excited about this guy. I would never get to take Big Tipper’s table – he wasn’t throwing around all of that money to impress sixteen-year-old-Rob – but that was fine, because the wait staff pooled all of the tips at the end of the night anyway. So I probably had it the best. There was no work on my part, no chance of screwing up the big tip, and I still got to cash in all of my extra big-tip money for singles at the end of the night and shower myself in dollar bills just like everyone else. This restaurant is one of the cheapest restaurants anywhere. You could bring in your whole family, get dinner and dessert, and it would still be hard to spend a hundred bucks. When most of the customers are leaving maybe two bucks on the table after a meal, having the Big Tipper come in was like winning a small lottery. He and his family ate, they left multiple hundred dollar tips, and left, handshakes and kisses to all the staff on the way out. It was great. I never really interacted with Big Tipper personally; I was always benefiting from the periphery of Big Tipper’s generosity. But when I think about him now, and when I thought about him back then, I always loved and hated him equally at the same time. It’s hard to explain. Or maybe it’s not. I loved him because he was just this presence, this giant dollar sign that came in and made my life a little richer, with nothing asked on my part. Maybe he didn’t even know that we pooled tips. But it was just nice to have somebody walk in out of nowhere and give me a lot of extra money. But if I weren’t a part of that extra money, I would have totally hated Big Tipper. Who the hell does this guy think he is? Everything about it seems so calculated. He picks the most inexpensive restaurant around, I think, on purpose, solely for the fact of inflating the appearance of his tips. If he went to a steakhouse or to any other nice place and ordered the way he and his family ordered, a hundred dollar tip, while I’m sure it would still be welcome, probably wouldn’t have seemed like that big of a game changer. You’re getting into percentages here, like a fifty percent tip versus a two hundred percent tip. The tip itself is the same, so just deflate the cost of the meal to bump up the perceived percentage of generosity. Which leads me to believe that this guy, this Big Tipper, doesn’t even care about the food that he’s eating. All he cares about is walking into a restaurant, opening the door for his wife and kids, looking out amongst the tables and seeing every employee turn to him and smile. Is this guy’s life so empty, so devoid of meaning that he’s willing to shower a complete group of strangers in absurd amounts of cash just to have a shadow of the feeling that he’s well-liked? And, since I clearly believe this to be the case, he’s OK with all of this? He looks out at the world and says, I’ll just buy whatever I want in my life, cars, houses, other people’s affection, all of it, all of it’s for sale. I’m still waiting tables, and every time somebody gives me a big tip, like bigger than I deserve, I’m always a little apprehensive. What do I do now? Am I supposed to give a really extra big thank you? Am I supposed to shake his hand? Kiss his ring? Get down on my knee? Twenty percent is totally appropriate. That’s fine. Money for a job well done. Twenty-five percent, OK, I get it, you like being generous. That’s great. Thank you very much. See you next time. Hope you had a nice evening. But thirty percent? Am I really that good of a waiter? I don’t think so. Thirty-five percent? Excuse me sir, but I don’t think you added up your bill right. Anything forty and over and I’m hiding out in the basement until that table is out of the building. No thank you. No goodbye. Just get the hell out, because I don’t know what you’re expecting from such a big tip, and I’m not at all ready to reciprocate. This entry was posted in Uncategorized and tagged Big Tipper, True Story, Waiting Tables on June 27, 2012 by Rob G..